This is a plan of a coastal section of the Lleyn Peninsula in Wales. The numerical annotations, or spot heights, shown in red ink at the top of hills and eminences are trigonometrically tested altitudes. 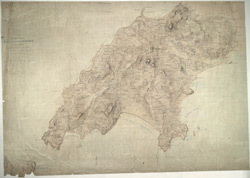 This drawing is formally titled and the area of the land recorded as 100.8 square miles. The manuscript paper carries a watermark from the James Whatman Turkey Mill, Kent, dated 1814.